Seán Nestor of Milltown TidyTowns Committee was highly commended as a SuperValu Community Hero at the SuperValu TidyTowns Awards at the Helix in Dublin yesterday. 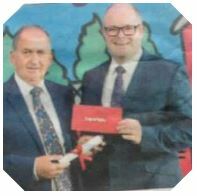 He is pictured (left) with Des O'Mahony, Interim Marketing Manager, Supervalu. MILLTOWN has once again been named as Co. Galway’s best-kept town in the SuperValu Tidy Towns Competition. A record number of towns and villages across Ireland took part this year, 870 to be exact, and Milltown topped Category A in the county with 323 points, beating off competition from Abbey (Loughrea), Monivea and Williamstown, which all scored 300 points or more. Incidentally, all four towns also finished in the same positions last year, and recorded similar point tallies. For areas with a population of less than 200 people, Milltown was given a silver medal award in the national category, while Abbey and Monivea received bronze awards. Local activist Frank Glynn, speaking on behalf of the Milltown Tidy Towns Committee, said that local people were happy to have retained the title. “We managed to finish first again, and we increased our mark up from the 318 we got last year. We won a silver award last year too, and we’ll be trying to move into the gold award section in time,” said Frank. “Our town has improved dramatically over the years, there’s been a lot of good work done with the River Walk and other things. There’s 14 people on the committee and they all have their own skills that they bring”. In Category B in Co Galway, Mountbellew placed third with 298 points. Tuam was in Category E, where the town scored 281 points and finished behind Ballinasloe and Athenry. Ballygar scored 271 last year, and were rewarded for boosting their overall mark this year to 287 with an Endeavour Award. The Headford Lace Project also won the Heritage Award. The overeall winner of the Tidy Towns Competition was Birdhill in Co. Tipperary. As well as that, Birdhill was also named Ireland’s Tidiest Village, and will be presented with a trophy and cash prize of €10,000. Milltown finished just eight points behind Westport in Co Mayo, who won the prize of Ireland’s Tidiest Large Town, as well as placing first in the North West and West Regional Award. A full list of the points scored by local towns and villages in their respective categories will be available in next week’s paper.